Butterfly Theatre Company specialises in site-specific and interactive theatre based on the Meisner technique, where script is learned and basic blocking observed, but otherwise gestures and specific behaviour are improvised and, most importantly, reacted to, on the spot. It is the belief of Meisner practitioners that this enables the theatrical experience to become more “alive” and truthful, as actors react to each other, and interact with the audience in a more free and spontaneous manner. Seizing the opportunity of taking her ideas to a new theatre, Director Aileen Gonsalves has brought the concept of lunchtime theatre to St James Theatre, where plays are condensed to 45 minutes and local workers can take their own packed lunch to the theatre or buy one for £5. I have seen lunchtime theatre both succeed and fail spectacularly. In more relaxed cities, such as Canberra, Australia, where flexi-time working patterns are the norm, it has been most successful. Sadly, in rushed and demanding London, it has generally fared less well. However, in keeping with the spirit of experiment and cautious risk of St James Theatre, the Studio space has taken it on, and is reaping the rewards. Following a sellout week-long run of “The Importance of Being Earnest” earlier in the year, Butterly have just launched a two-week season of “A Midsummer Night’s Dream”. This production, set in current Victoria with all the building work going on, is clear and well-produced. Using projected slides to help set the scenes, and every part of the Studio space from balcony to bar, the action moves between occasional modern speech to facilitate narration, to the Bard’s own words. The cast double –up as fairies, ‘mechanicals’, lovers and royalty as required. There were good performances, most notably from Paul Harnett as Bottom, Owen Pullar as the mischievous Puck, and Hayley Cusick as Helena. 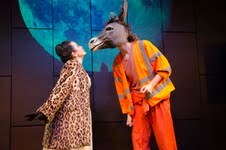 Caroline Colomei also showed clear contrast between her roles as Quince and Titania, and command of Iambic Pentameter. The play has been well ‘reduced’ by Gonsalves from its usual 2 and 1/2 hours, with cuts judiciously chosen and highlights the two main storylines of the four lovers, and the play within a play of the Rude Mechanicals. There were flaws in both direction and performance. I would like to see much greater contrast of social class between the Royal couple and the young lovers, where the Royals need to be more regal; and in the case of some of the recent graduates, more careful observance of diction, particularly end-consonants, and a greater mastery of Blank verse. However, these lapses were less noticeable in the more stylized “play” scene. In the effort to show Shakespeare as relevant and neither declamatory nor too “posh”, these disciplines are sacrificed at any production’s peril. These reservations aside, this is a delightful way to spend a lunch hour and I urge you to see it. It adds to the tremendous variety in the cultural landscape of this great city, and shows every sign of attracting new theatre audience amongst workers in St James’s immediate vicinity. It would be good to see similar ventures succeed elsewhere. 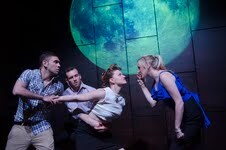 This entry was posted in Theatre Reviews and tagged A Midsummer Night’s Dream, Butterly Theatre Company, Caroline Colomei, fiona jane weston, Hayley Cusick, London theatre, Lunchtime Theatre, Meisner, Owen Pullar, Paul Harnett, Shakespeare, St james Studio, St james Theatre. Bookmark the permalink.